Oil painting on canvas 36 x 28 inches, and contained in its original superb carved and gilded 'oak-leaf and acorn' frame, surmounted by an armorial cartouche. Inscribed with the sitter's identity and dated 1716. Note: this is a head and shoulders variant, of autograph quality, of the full-length portrait now in the Bank of England Museum (see below), which was sold at the same time in July 1932. The original inscriptions on the two paintings seem to be by the same hand. Another version of this composition, of similar size, is to be found in the Frans Hals Museum in the Haarlem (0s-1-278) where it is attributed to Richard van Bleeck (1670- after 1747). One of the great merchant financiers of his time, Bateman built his success and colossal wealth upon the considerable mercantile business established by his father, a Flemish émigré naturalized in 1660. His Dutch Calvinist upbringing and his family’s marriage links with several leading London Dissenters inevitably helped to shape his Whiggish outlook. From 1683 or 1684 he was resident at the Portuguese port of Alicante where he was engaged in the lucrative wine trade. He had returned to London by the early 1690s, and having already amassed a sizable fortune he continued to operate on a large scale as an Iberian wine importer. He quickly assumed a prominent position within the City, lending £10,250 on the land tax in 1693, and became a major subscriber to the Bank of England at its inception in 1694 and one of its founding directors. He was also involved at this juncture in the campaign for a new East India Company in rivalry to the existing Tory-dominated company, and was a signatory to an unsuccessful petition for this purpose presented to the Commons on 8 Jan. 1694. In the 1695 election he took the bold step of contesting Totnes against the Tory magnate, Sir Edward Seymour, 4th Bt., but suffered a humiliating defeat. The precise circumstances of his candidature in the borough remain unclear, but he clearly saw the acquisition of a parliamentary seat as a means of enhancing his status and influence. As a result of his involvement in the Company of Scotland in 1695, he came close to being impeached along with his fellow directors following the House of Commons’ inquiry which concluded in January 1696. The inquiry’s report, considered by the House on 21 Jan., spoke of Bateman’s ‘contradictory answers’ and he was consequently declared guilty of high crimes and misdemeanours. Though a committee was ordered to prepare his and the other impeachments, it never reported and the issue lapsed with the close of the session. He was one of a consortium of businessmen who in 1697 was remitting money to the forces in Flanders, and in April that year was appointed one of the trustees for circulating Exchequer bills, at a salary of £400 p.a., he himself having subscribed £2,000 towards funding the bills. The end of his first term as a Bank director in August, along with his colleagues Sir Henry Furnese and Gilbert Heathcote, was much regretted by government officials such as Secretary Vernon who regarded them as ‘useful men in their several kinds’. The following year he was chosen as a founding director of the New East India Company and in December he was knighted. A parliamentary seat still eluded him, however, and in the general election of January 1701 he failed again, this time at St. Mawes where he appears to have been a candidate on the New East India Company interest. It may have been Bateman’s failure to enter Parliament that steered him into City politics. In February 1702 he was elected sheriff, and in March 1703 he stood for alderman of London, but although he was one of the two candidates elected, he was not nominated by the court. On his father’s death in 1704 he inherited property in London, Hertfordshire and Kent, and the following year he purchased the manor of Shobdon in Herefordshire which became his principal country seat. It appears to have been this geographical proximity to the Harleys that brought him into a closer and, as events were to prove, beneficial acquaintanceship with Robert Harley*. He finally achieved his ambition of becoming a London alderman in 1708. At the time of the subscription for doubling the Bank’s capital in March 1709, Bateman’s stock amounted to £10,300, making him one of the select band of 24 City figures with stock at £10,000 or more; his subscription to the Bank on this occasion amounted to a further £10,000. After the dismissal of Lord Treasurer Godolphin one of Harley’s chief concerns was to ensure that his government had sufficient financial access in the City. His private correspondent John Drummond, a prominent banker at Amsterdam who knew the workings of war finance intimately, advised Harley in August 1710 on the importance of securing ‘such a man who has credit abroad as Sir James Bateman or Sir Theodore Janssen who, next to Furnese, and I may say Sir James preferable to him, has the best interest and credit abroad’. Drummond further advised in September that Bateman would be invaluable as the government’s remittancer at Antwerp ‘where the subsistences of the native British troops are paid’ and where ‘he is in great credit’. Moreover, Bateman’s amenability could be guaranteed, Drummond felt, by virtue of his having been ‘disobliged this year by the Whig cabal of the East India Company’ which had apparently blocked his re-election to the company’s board in April. His political outlook remained intact, however, and he proceeded to campaign, unsuccessfully, as a Whig candidate for London in the October general election. It is not clear if Harley made use of Bateman’s financial services in the Low Countries, but the ministry’s need for stronger support from the monied men of the City became acute during the winter when the Whig directors of the Bank attempted to wreck Harley’s scheme to fund Exchequer bills. To this end, Harley, in April 1711, set out to capture the directorates of the City’s two Whig strongholds, the Bank and East India Company, and headed the ministerial list with Bateman as candidate for the governorship of the Bank. In common with a number of Whigs, Bateman was evidently willing to accommodate himself to the new Tory government, but how much he was prepared to compromise his Whig background and principles can only be gauged from his later behaviour in the Commons. Harley’s immediate plans were foiled when Bateman and the others on the ministerial ticket were defeated, but he kept Bateman well to the fore in his subsequent plans to ease the government’s financial problems. Strings were pulled to have him promptly brought into Parliament. When a seat became available at the Somerset borough of Ilchester in mid-May, Harley instructed his Treasury colleague Lord Poulett, who controlled the seat, to ensure Bateman’s return; this was accordingly done on 2 June without even requiring Bateman’s presence. Lord Oxford (as Harley had since become) had probably by this time already allocated to him the central role of sub-governor of the newly established South Sea Company, the chief purpose of which was to assist in the recovery of government credit by funding public debts. Bateman helped in backing this new venture with a subscription of £9,000. On 13 May 1712 Bateman featured among the supporters of a bill proposed for continuing the South Sea trade as initially authorized under the recent legislation establishing the Company, and presented the bill himself next day. A rumour in March 1713 that he was to be elevated to the peerage proved without foundation. Having assisted the government with a loan of £65,000 for the navy in July 1712, in return for which he received the equivalent sum in South Sea stock, he was included on the naval estimates committee of 29 Apr. and made further substantial loans in 1713. On 14 May he helped to promote the ministerial line on the commercial aspects of the peace settlement by seconding Arthur Moore’s motion for a bill for implementing the 8th and 9th articles of the commercial treaty with France, and duly voted for the bill at its report stage on 18 June. Earlier, on 2 June, he had acted as a teller in favour of preserving the Royal African Company’s monopoly. Bateman was returned again for Ilchester in 1713. In his capacity as sub-governor of the South Sea Company, he was involved in the protracted negotiations over the division of the profits of the asiento between the Queen, the company and certain individuals believed to be acting for Bolingbroke (Henry St. John II) and Bolingbroke’s close associate, Arthur Moore. The matter was eventually settled to the company’s satisfaction, but Bateman’s suspicions of Moore’s activities led him to alert the other directors to evidence that he was using one of the two asiento ships for his own private trading purposes. Bateman’s exposure of Moore proved to be the preparatory step in the full-scale parliamentary attack launched late in the 1714 session, encouraged in part by friends of Lord Oxford in their efforts to discredit Bolingbroke. In the Worsley list Bateman was noted as a Tory who had sometimes voted with the Whigs during the 1713 Parliament, but after the Hanoverian succession he reverted to full Whig allegiance though supporting ‘the Prince’s party’ in the first years of the ‘schism’. 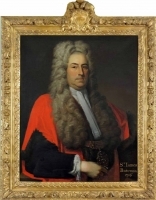 Sir James was elected Lord Mayor of London in 1716 (the present portrait celebrates his election), and he served as Lord Mayor until the following year, 1717. He died of ‘gout of the stomach’ at his house in Soho Square on 9 Nov. 1718, and was buried at Tooting, leaving a fortune reputed to be worth £400,000, which besides property included £30,000 in cash. To his eldest son, William†, who was raised to the Irish peerage as Viscount Bateman in 1725, he left his Herefordshire estates valued at £14,000 p.a., while his two younger sons, James and Richard, inherited his estates in Tooting, Kent and in Essex.